The Desert Diamond West Valley Casino in Glendale opened December 20, 2015. It is located near Loop 101 and Northern Avenue and near the sports and entertainment district of western Maricopa County. Must be 21 to enter bars and gaming area. Class II Gaming - The Tohono O'odham Nation has filed a lawsuit against the state to allow Class III Vegas-style gaming. 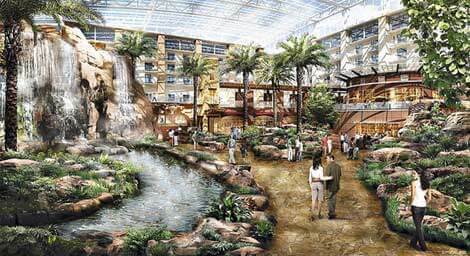 The casino is the first phase of a master plan to build a 1.2 million square-foot casino resort with a spa hotel, a 3-acre atrium, event center, restaurants and bars, retail space, and a convention center. 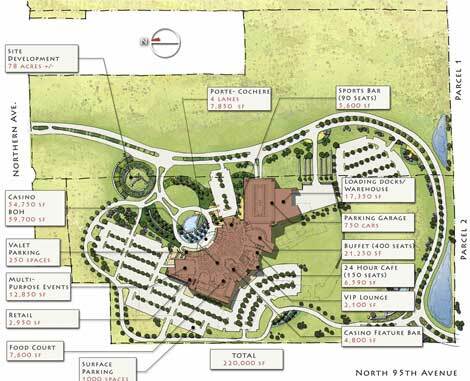 The property size is 78 acres of a total 135 acres. Construction of the remaining phases is estimated at 32 to 44 months and a cost is $607 million. The Tohono O'odham Nation had thousands of acres of their land in the San Lucy District ruined by continuous flooding caused by federal construction of the Painted Rock Dam. To compensate the Nation the U.S. Congress passed the Gila Bend Indian Reservation Lands Replacement Act (Public Law 99-503). The law authorizes the Nation to buy unincorporated lands in Pima, Pinal, or Maricopa counties as replacement reservation lands. It also directs the U.S. Interior Department to transfer the replacement land into federal trust. In 2003 the Nation purchased 135 acres of unincorporated land near Glendale, Arizona, as replacement land for the purpose economic and community development. The Nation asked the Secretary of the Interior to take into trust allowing them to build a casino per the Indian Gaming Regulatory Act (IGRA). Lawsuits challenged the qualifications of these 135 acres as replacement land. The tribe has won 19 lawsuits, and expects to win two more in 2016. The grand opening of the first construction phase was celebrated December 20, 2015. 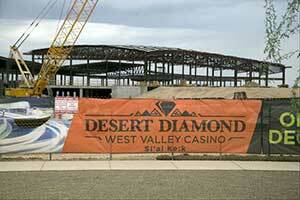 The Desert Diamond West Valley Casino recently held a topping off ceremony for the construction of the new gaming venue. 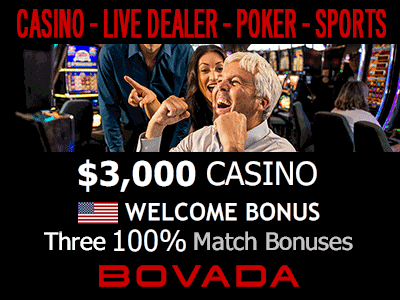 The casino is owned by the Tohono O'odham Gaming Enterprise (TOGE). Placing the final steel beam into place is a major mile stone for the project as it nears the completion. The project will cost $400 million to complete. 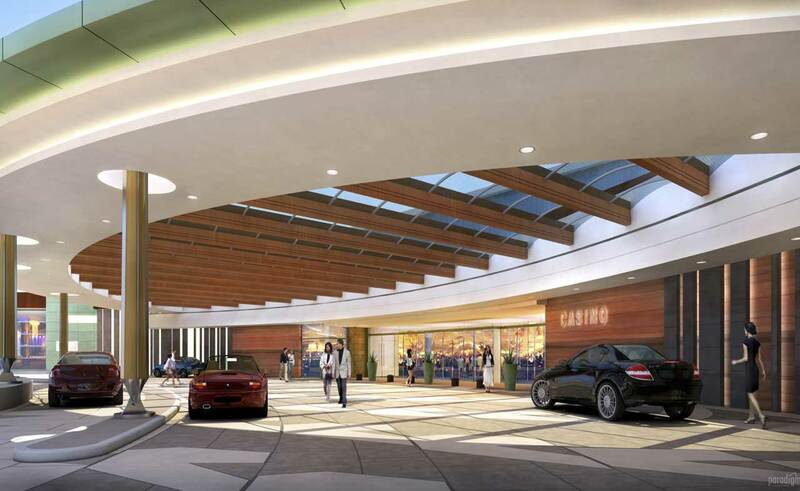 1,500 people have been contracted to work on the construction of the new casino. When the gaming venue opens 1,600 people will be employed to work there. The casino floor will be 75,000 square feet. There will be Class III gaming offered. This includes poker, blackjack, slot machines, and live bingo. The casino will also offer a total of five options for dining. Plans were first announced in January 29, 2009 by the Tohono O'odham Nation. Legal battles and lawsuits were filed shortly after the project was announced. In December of 2015 the tribe was able to open the temporary casino building to the public. Construction began on the new casino building in December of last year. The interim gaming facility has continued to be in operation while the construction has continued on the new building. There are currently 600 people employed at the casino. 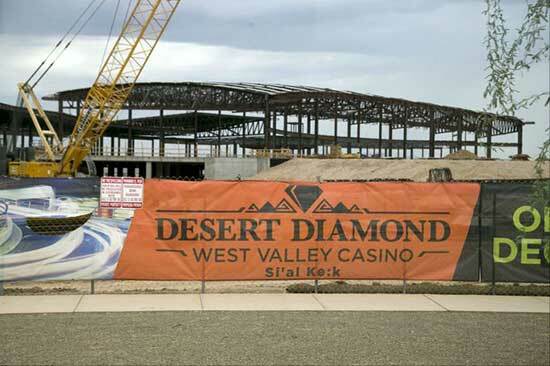 The end of next year is when the soft opening of the new Desert Diamond West Valley casino location is scheduled to open.